FROM THE EVERGLADES to the Panhandle, the bays, beaches, and bayous of western Florida produce excellent action for the fly caster and some extraordinary talent at the vise. Any list of noteworthy tiers from this region would have to include angler Nick Reding of Longboat Key and Capt. Steve Bailey of Fort Myers. Although both have honed their skills from years of chasing the same local game fish, each has developed his own unique tying style and philosophy. While Bailey is a professional guide, Reding is an accomplished “civilian” angler. 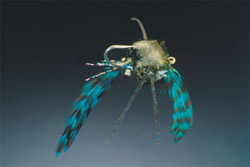 And though Reding likes to develop original patterns, Bailey concentrates on tying traditional saltwater flies with his own unique modifications. What they have in common is the ability to produce well-constructed flies that catch fish when others won’t. Here’s a look at a fly box full of their favorite patterns. Of all the species that Nick Reding hunts, the shallow-water redfish of Tampa and Sarasota Bays are his favorites. Reding has made a study of the game here, and he has observed that west-coast reds behave differently from their Texas, Louisiana, or even Florida Bay brethren. According to Reding, “Tampa reds don’t tail often, they run large, and they spend a lot of time laid up in potholes and around oyster bars.” Reding finds them averse to the plop of a weighted fly. The bulk of their diet (hence the flies he ties for them) consists of pilchards, small mullet, crabs, and shrimps. His imitations of crabs and shrimps have met with equal success in Biscayne Bay for both bonefish and permit. This material is perfect for the crab flies he ties, and he employs other sound-absorbing features, such as palmering the body with extra-webby saddles and wrapping Crystal Chenille around the eyes. He may also pad the tail with marabou and wrap part of the body with crosscut rabbit hair. Redfish and grass are synonymous on Florida’s western coast. 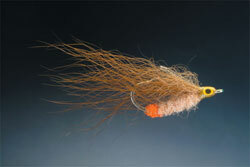 Yet many of the most effective redfish flies have a tendency to become tangled in the grass. To prevent fouling on some flies, Reding employs a Bob LeMay–style weed guard constructed of two 20-pound pieces of Mason hard monofilament that stick out in front of the fly like antennae, allowing it to ride above the grass. Reding also uses an inverted rabbit strip wing to hide the hook point. In addition, he employs a “forward wing” (see introductory Stiltsville Shrimp photo) tied from bucktail or synthetic fur to prevent the fly from catching on weeds. 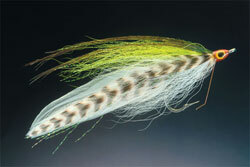 Another of Reding’s favorite flies mimics baitfish. Although Tampa Bay redfish eat a wide range of small fish, their primary food sources are pilchards and finger mullet. Reding calls the fly The Jerk because it was inspired by a jerk worm. He ties the fly on a size 1 Tiemco hook, and the pattern is about 4 inches long. The head is weighted with 1/16-ounce lead eyes wrapped in Crystal Chenille. He ties the body with Crystal Chenille and then ties in a rabbit strip with the hook pinned through the strip to hide the point. 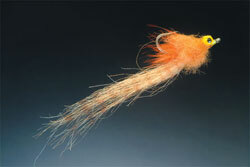 Many of Reding’s flies are shrimp patterns, which are effective on a wide range of species, from redfish to tarpon. He ties one, dubbed The Wizard, on a size 1/0 to 3/0 hook, depending on the species he’s targeting. The body consists of Mylar tubing slipped over a body of cross-cut rabbit. He epoxies the tubing to approximately one centimeter behind the hook eye. After a few casts the Mylar unravels, adding sparkle to the waving rabbit. 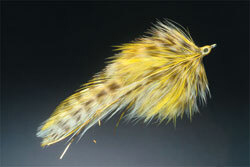 Although Reding has no problem tying realistic flies, he finds that an impressionistic fly works best in some cases. His favorite is the Afro-disiac, a type of saltwater attractor pattern featuring a tail of marabou, Kraft Fur, and Krystal Flash. The body is palmered soft, webby hackle with a wool head and lead eyes. The fly appeals to Reding because it lands softly and can be tied in different sizes and colors to suggest different prey. He ties red-and-white or chartreuse-and-white patterns to approximate baitfish, and tans and pinks to imitate shrimps. Reding even ties one in black on a 4/0 hook for tarpon. “It’s a very versatile fly,” says Reding. “Capt. Tom Shubat of Anna Maria Island turned me on to the color, and it works great. Sometimes you have to do what’s counterintuitive to catch a fish,” he says. But whether he’s matching the baitfish or just trying to create an impression, as Reding’s patterns show, on-the-water observation is always the key to innovation at the vise. Capt. Steve Bailey was tired of flies that fell apart after just a few casts. He wanted flies that would stay together, look good proportionally, and fool the fish. That was 27 years ago, and after nearly three decades of tying, he’s learned to tie flies that come alive with the proper retrieve and presentation. Bailey doesn’t claim to have invented many new patterns. Instead, he prefers to modify traditional patterns based on his experience and the particular habitats he fishes, believing that the construction can make the difference between a take and a refusal. “I start with tight, even thread wraps throughout the fly, which help avoid lumps and makes for smooth bodies,” says Bailey. 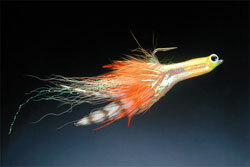 “I build flies that taper; I never stack bucktail or other hairs when I make a wing. A fly shouldn’t look like a paintbrush. I carefully stagger the tips before tying them on. I want the wings to flow and taper at the ends so that it looks more like a minnow — thick at the head and narrow at the tail.” Bailey considers himself “old school” and primarily uses natural material. He employs synthetic flash sparingly and trims it to different lengths, tapering it to the tail. According to Bailey, proportion is one of the most important factors when tying flies. 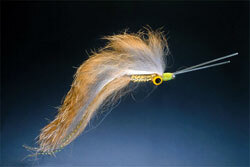 He uses a ruler to measure all feather wings and has marks on his vise for bucktail lengths. His flies ride correctly in the water because he knows exactly where to place the materials. Bailey has learned that you can tie an innovative fly, but if it’s not carefully crafted on the vise, it won’t catch fish. He ties the following traditional patterns with innovations learned from years of experience. When tying Lefty’s Deceiver, Bailey places the bucktail in three clumps, one on each side and a longer, usually different color on top. Very little hair goes on the underside so that the fly rides straight in the water. He sizes his flies down to a number 2 or 4 hook because they’re more effective on the fish he stalks in Pine Island Sound. Bailey ties bigger Deceivers on a 1/0 hook when fishing for large snook in the local rivers. But once again, it’s a few basic designs, tied carefully, with attention to proportion and construction. Lefty Kreh showed Bailey the Clouser Minnow pattern long before he remembers anything being written about it. “I was tying some flies for Flip Pallot at the time. Soon, he sent me a letter and told me to tie all the hair on top, as he thought the fly would ride and fish better. That’s the way I have tied this pattern ever since,” says Bailey. He uses 1/50-ounce lead eyes on a size 2 hook, building his Clousers with the same eye for detail he brings to tying other patterns. He also adds a 20-pound hard Mason two-legged weed guard, which he ties on all his flats flies. Bailey especially likes a Clouser when he’s casting to fish cruising sandy shorelines. The Sea-Ducer is Bailey’s number one pattern to use on very shallow, thick grass. He likes a size 2 hook with a two-legged weed guard and mixed colors. His favorite combination is a white, yellow, and grizzly pattern. “This is a very old color combination but one that is seldom seen today,” says Bailey. “It makes a beautiful, mottled fly that could resemble a shrimp or minnow.” He uses thick, webby saddle hackles for wrapping the hook shank and matches the hackles for size. If he wants a Sea-Ducer to sink quickly, he uses hackles with very little web. 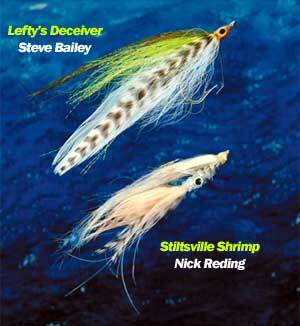 The Snapping Shrimp is another Bailey favorite, learned many years ago from South Florida fly tier Don Ingram. Bailey never liked flies with wrapped yarn bodies, and he avoids tying with Fishair, the synthetic material normally used in the wing. On the other hand, he found the fly to be extremely effective on bonefish and redfish, so he came up with some modifications. According to Bailey, “The fly just didn’t look alive to me. I chopped the yarn up, put it in a blender, and made a fur out of it. Then I teased the fur out and put it into a dubbing loop of thread. When it’s twisted up, it looks like rough chenille. Then I wrap it up the hook shank, tie it off, and trim it to shape. For the wing I chose black bear hair. Only the guard hairs are black, and the underfur is brown to dark tan.” Bailey leaves plenty of the under fur in when he ties the wing on. 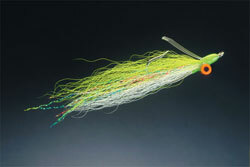 The fly is easy to tie, and the trimmed body shines and feels a little crunchy. In the water The Snapping Shrimp has a beautiful flowing wing that moves with the slightest twitch of the line. It is light, lands softly, and most important, looks alive. To fly fishermen such as Reding and Bailey, fly tying has reached a level at which form is as important as function. Fish mistake these creations for food because they are balanced and act like their prey. And the fact that they look good probably gives the angler more confidence and improves their odds as well. Whatever the case, these innovative west-coast fly tiers create beautiful flies that catch fish, all built upon the core principle of knowing their quarry and its prey well before sitting down at the vise.